One of the major illnesses I deal with is called Gastroparesis (GP). GP is a fancy way of saying the stomach and intestines stop moving like they’re supposed to and have trouble emptying food. As a result, I deal with nausea and stomach pain on a daily basis, and fill up after only a few bites of food. I don’t often talk about my symptoms because they seem dwarfed behind all of the other problems from my neurological illness, but they have been a constant presence in my life since 2013. My GP symptoms have been a lot worse since around Christmas, and I have basically been forcing myself, over the nausea and stomach pain, to try to get enough to eat. As a result I have lost 20 pounds unintentionally in just a few months, and my fatigue has been a lot worse. I managed to stabilize my weight by eating empty calories, but I know I haven’t been getting enough nutrition. In May of this year, I started having trouble speaking and a short while later also developed swallowing problems. These have been gradually getting worse, to the point where over the last few weeks it’s been hard to swallow enough fluids. My doctors and I made the decision that it was time to get a feeding tube. I had surgery last week to have a J-tube put through my stomach wall and into my intestine. 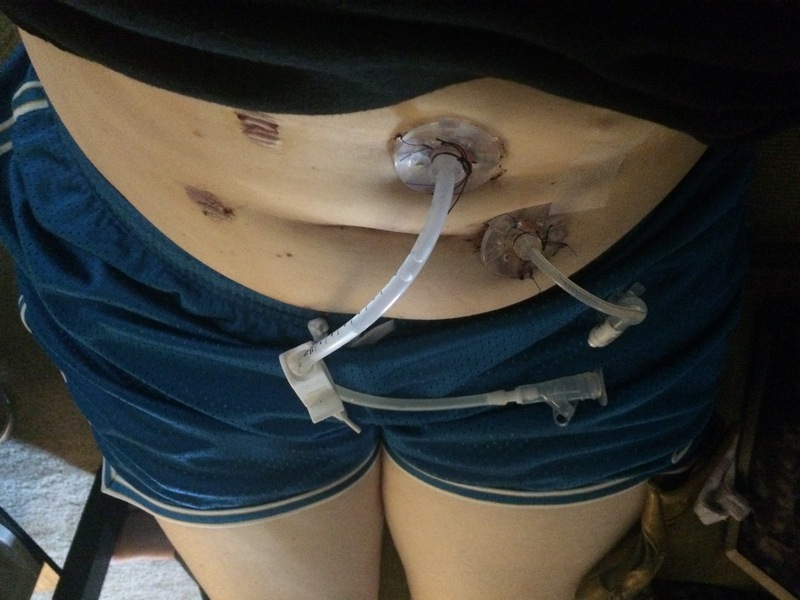 I also had a tube placed in my stomach so that I could empty it when my nausea is bad. Since then I have been getting formula delivered continuously to my intestines via a pump. Feeding into my intestines reduces many of the symptoms caused by having food in my stomach since food is now delivered further along in the digestive process. The downside is formula has to be pumped in very slowly, so I am connected to a battery operated pump 24 hours a day. I’ve been shocked that I have more energy than I did before getting the feeding tube, and I feel a bit better in general. Unfortunately, fatigue is still a big problem but at least it’s easier to handle with the small boost of energy from the feeding tube. As a physician, I never thought that a feeding tube could be ‘healing,’ and yet so far I have been surprised at how much mine has helped me. It has been a huge adjustment getting most of my food through a tube, and there is a lot involved in tube feeds and taking care of a feeding tube. I am still allowed to eat, but more than a few saltines usually leaves me doubled over nauseous and in pain. I thought I would miss food more, but between the GP and swallowing issues eating has become quite the chore. I do miss enjoying food, but am grateful I now have another option to get the nutrition I need. I am going to post a lot more about feeding tubes in the coming months, as this is a part of my new reality. For now, I thought I would share a post by a young woman who also deals with GP. She does a great job explaining tubes a bit more. Previous PostDisability and IdentityNext PostMy Body, Inc. Thank you for this wonderful post. I am also a physician with GP for 15 years now. I’ve managed to stay alive for this long, but medical training has lead me to the point of needing more intervention. The medications don’t work or cause terrible side effects. I’m very nervous about getting a g-tube. I am so exhausted most days that I feel like I’m slowly dying. Do you feel that it has made you feel semi-normal? For instance, can you work and exercise like most people?